We give many questions on caring for tadpoles and frogs. 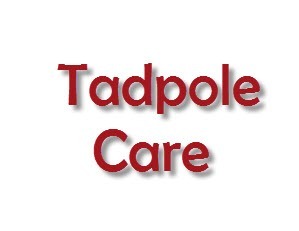 Please see our informative writeup and information and FAQ's below on how to care for tadpoles, what to feed them, different stages of development, buying frogs eggs and tadpoles, how to raise them, and how to maintain proper water care. Growing your own tadpoles that can buy from us is very easy to do. Growing/raising tadpoles you will see them go through metamorphosis which means that they change from their tadpole form into a full frog as part of the development of the creature. What to expect when you receive your frog eggs and tadpoles. All of our tadpoles come in various stages from wigglers which means that they will not have any legs whatsoever and are quite small to some may be further on it in development and have two sets of legs on the back of the body. Always check with the local laws in your nature and wildlife department to make sure it is not illegal to gather frogs were tadpole eggs from the wild. In many locations this can get you a hefty fine. As far as I know in all national parks reserves government land it is illegal to collect these without a permit. Also check to make sure it is not illegal to release the frogs or the eggs back into the wild as this will vary from location to location as well. The reason why is if the frogs a non-native species it can have a huge impact on the local environment and caused damage to many other insects and animals. This is not just true with frogs but is also true with most animals. What to frog eggs look like? Once the mommy and daddy frog decide to have a baby, well lots of babies they usually find a nice moist watery area such as a pond or lake that has very Stillwater and the mommy squirts the eggs out in the daddy realizes. These frog eggs have nice little black dots in the center a kind of look like gelatinous clumps with the eyes. Now these are not real eyes these are just the embryonic stage of the beginning growth of the tadpole. If you want to see some more pictures on the embryonic or development timeline of frog eggs of many North American species such as Leopard frogs bullfrogs etc. be sure to check out the Wisconsin Department of natural resources as a have a very informative guide. How do we get our frogs and tadpoles. Collecting the eggs and wigglers of frogs the smaller stages of life is pretty easy to do. Go out to big pond behind the house and scoop them off the top of the water and sift out the junk and keep the eggs or tiny tadpoles. After we’ve collected the tadpoles to put them in a large 55 gallon aquarium and keep them fed and give them plenty of light. Water that we use is directly from our collection site where we gather the eggs. This allows us to have a more natural environment for critters. You cannot use water directly from the sink without using solutions to remove the chlorine and heavy metals as these will poison and kill your tadpole within days. The same is true for frogs as these are basically toxins. You can purchase our water conditioning kit directly from us to help ensure long healthy lives of your animals. Many people want to know what they need to feed their tadpole. This varies as there are many different types of tadpoles but most of them are herbivores which means they eat mainly fruits and vegetables and are not meat eaters at this stage. This may come later in life. We offer tadpole food that comes in a tablet form or flake form that allows you to scrape very small minute amounts from the compressed tabs into your container for your keeping your animal. Please remember that only need about 2 to 3 sand sized dots of this tadpole food until they start getting larger. Do not over feed ever. This will cause ammonia to spike in your container which will burn the skin and kill your animal. Prepare to be amazed as your tiny tadpole starts changing from a tiny wiggler into a wiggler with legs and then into a full frog. The time. For the metamorphosis varies from a few weeks to a few months and on rare occasions such as the bullfrog can take up to two full years. The whole metamorphosis process is just like a baby growing to a toddler and teenager up to a full adult. There a lot of stresses during this time so do not handle the tadpole until they become a full adult and make sure that your hands are clean with no toxins or chemicals such as soaps and bleaches as these will leach out and possibly kill your animal. The first part a stage of the growth is from the egg sac. The egg sac is a tiny gelatinous ball that has the nutrients needed for the tadpole to eat in its first stages of life. After the egg sac is totally consumed the body of the tadpole slowly starts to change. Outside of the body the development of the high legs starts first and then usually the formation of the front legs begins after that. The whole body shape of the animal will start slowly going from a sperm shaped animal into the growth of frog. Many other changes in the body also occur during this time. Since tadpoles live underwater they have deals so that they can breathe. Once they are turning into frogs they will need lungs to breathe air to this development is critical. Changes in the digestive area also occur during this timeframe as they may be changing their diet as well and may be changing from strictly herbivore to carnivore which means that they were eating fruits and vegetables and now are changing to a diet of meat. For the in the metamorphosis the tail is absorbed back into the body. This is a very neat experience to watch. As a tail was specifically for allowing the agility and water and will not have any positive impact once the tadpole turns into a frog and makes its way to land. During this time frame you also notice that the animal is eating much less. This is normal and do not be alarmed. Then here’s an important point to remember once the final stages of metamorphosis have begun it is very important to remember that the frog will need to be a will to get out of water. You need to provide sticks, wood, rocks, ramps, little toys, or other platforms that will allow the animal to leave the water to go to a dry land area. Remember that without that your animal will perish. Some people make two separate areas in the fish tank or an aquarium that will allow this progression to happen. Food at this stage when the pollywog has turned into a froglet can include crickets lies blood worms and any other small insects or invertebrate food. These will need to be meat type substances as this is what the frogs like to eat.